The Chatham & District Light Railways Company began operating electric trams around the Medway Towns in 1902. The first routes ran within Chatham and Gillingham only. However Rochester’s original distaste for such mechanical intrusion into the ancient city was dispelled with the evident success of the Chatham system, and after a flurry of competing proposals during 1903 the tramlines gradually extended into Rochester over the next two years. A major extension to Rainham in 1906, followed by lines to Strood and Borstal in 1908 saw the system achieve the network of routes recognisable to Medway townspeople for the next 50 years. The original fleet of 25 elegant Edwardian vehicles eventually doubled in number. The depot and generating station at Luton had been built with expansion in mind and were each large enough to service the whole system. Fares were deliberately set low, given the volume of traffic of both workmen and servicemen. Service frequencies varied between 10 and 15 minutes. The trams carried on through the First World War, but the neglect and deprivations of the times took their toll. Coupled with increasing competition from motor buses, including several individual owner-operators, things got progressively more difficult for the trams. A backlog of repairs and renewals to trams and infrastructure was partially addressed, but the cost of both materials and wages was increasing. 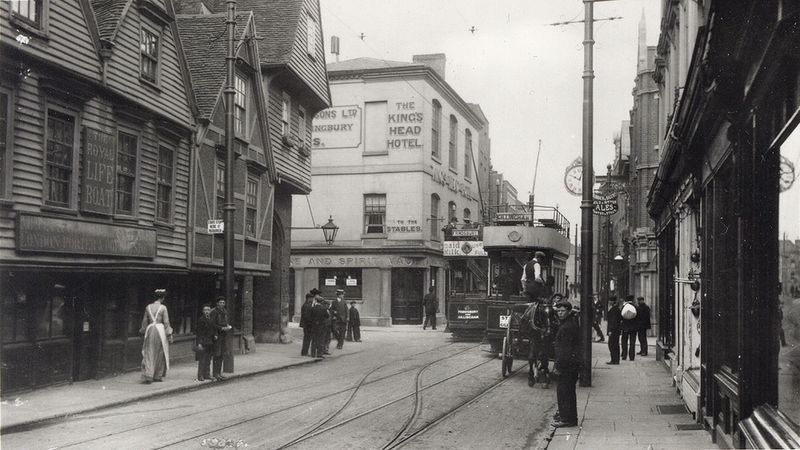 A turning point came in 1927, when the British Thomson-Houston company, which had originally promoted the tram system, sold its interest to the Maidstone & District Motor Services Ltd. “M&D” had been set up in 1911 and over subsequent years had developed a network of routes around north and mid-Kent, including several around the Medway area which supplemented the tram services. Although the trams still continued to run, economies were introduced and the system began to look run down. Whilst the trams when new were fitted out with typical Edwardian exuberance, after almost 30 years of use they’d become literally the worse for wear. Like many of those towns who had so enthusiastically introduced them around the turn of the century, Medway decided the trams’ day had passed. 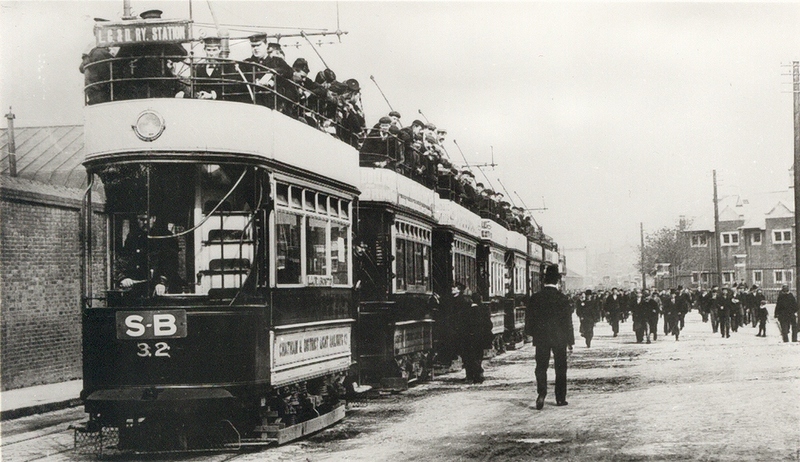 Chatham’s trams were of two main types, both shown in this well-known photograph of a line of cars waiting for Dockyard workers at Pembroke Gate. All were roundly 28 feet long overall, with 16-foot saloons, and ran on 4-wheel “trucks” of 6ft wheelbase. The Chatham system was laid to a track gauge of 3ft 6in, common in British towns with narrow streets, the cars being just 6ft 3in wide. The first batch of 25 cars were built by Milnes of Hadley, Shropshire and were delivered in 1902-3. 23 further vehicles were supplied by Brush of Loughborough between 1903 and 1911 as traffic grew. Two further cars from the United Electric Car company of Preston arrived in 1911, which may have become prototypes for further deliveries. However the Great War intervened and things changed significantly thereafter. The nearest tram in the photo is one of the first delivery of Brush cars, with two Milnes vehicles behind it. Note that the spiral staircases to the open top decks are differently orientated. The destination shown on car 32 is “LC&D RY. STATION”. This meant the Chatham station of the London Chatham & Dover Railway, although by the time the trams began operating the railway would have been known as the SE&CR (the marketing name, as we would now say, of the “South Eastern and Chatham Railway Companies Managing Committee”). These things take some time to work through! The metal “S-B” plate, meaning the route between the Station and Brompton, is displayed and the car carries a supplementary route board under the middle side window. The trams carried a livery of “light grass green and cream”, originally with the company name in full on the lower body side “rocker” panels. A garter belt device appeared above this. A car on Rainham Road, near the Jezreels, in 1928. As time went by the image slipped somewhat. The full company name disappeared and the cars generally became run-down. They were all withdrawn at the end of service on 30th September 1930, the oldest after 28 years of stalwart service. They met a somewhat inglorious end, being stored on the reserved track section of the Rainham route prior to scrapping. The system opened in June 1902 running services within Chatham & Gillingham only. Chatham tram services were never numbered. Destinations were shown by a roller blind indicator, supplemented by metal plates carrying a letter code representing the two termini of each route. Each route had differently coloured plates and lettering, an arrangement said to be in acknowledgement of the low level of literacy of the times. Side route boards were also carried initially. Extensions to Rainham in 1906 and through Rochester to Borstal and Strood by 1908 saw the system reach its fullest extent. These later routes were also displayed by coloured plates, but the letter code was not continued, the terminal points being spelt out in full. Frindsbury to Gillingham Green via Rochester, Town Hall and Brompton. 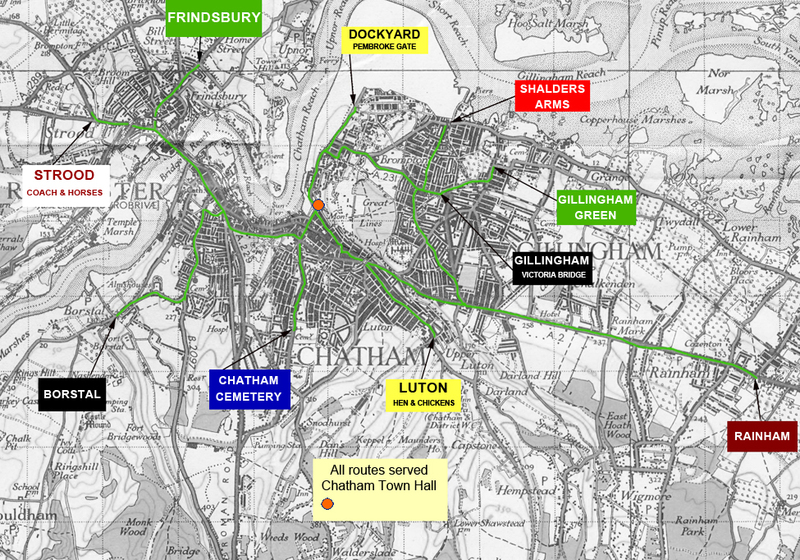 Strood Hill to Gillingham Green via Rochester, Town Hall and Brompton. Borstal to Gillingham Victoria Bridge via Delce**, Rochester, Town Hall and Brompton. Town Hall to Rainham High Street via Chatham Hill, Jezreels and Rainham Mark. **Delce meant that part of Maidstone Road (Rochester) running past the former Delce Mill, not Delce Road running up the bottom of the adjacent valley. “Town Hall” was, of course, that at Chatham which from tram days was the focal point for all services.